David Ralph, HR Manager at Atlas Leisure Homes, and Jeremy Gale, Production Manager at Atlas Leisure Homes, with new recruits Jason Williamson and Michael King. The programme, which provides nine weeks of training and work experience, was introduced last year, with the first group of 20 candidates starting in January. Since their training and placements came to an end in March, 9 of the trainees have been offered jobs with some of East Yorkshire’s biggest manufacturers, including Atlas Leisure Homes, Willerby Holiday Homes, Continental Leisure Vehicles and glass supplier and processor Kwik Tuf. The innovative Pathway to Employment programme is being delivered by Hull City Council, Unity Training and Jobcentre Plus, helping people to develop their skills and assist people back in to work. The next group of candidates began their training in early April, with work placements starting in May. The Pathway to Employment programme is a brilliant initiative which has proved that it can deliver genuine results for people to find long-term, viable employment following a bespoke 10-week training scheme. By working closely with Jobcentre Plus and East Riding of Yorkshire Council, the Green Port Hub, in Hull Central Library, has been instrumental in helping to deliver these results, and it is encouraging to see that 9 candidates are already in full-time employment. This demonstrates the solid commitment the Council has towards getting people back in to work. With the combined Siemens and ABP investment in the city, aspirations within the local community have been raised, and it offers those interested in pursuing a career within the manufacturing sector the chance to improve their existing skills base, in turn creating well-rewarded jobs. The Pathway to Employment programme aims to support local people in accessing the skills and training that they will need to apply for the jobs Green Port Hull will generate. We are delighted that it’s proving successful and that a high number of candidates are gaining full-time positions within the manufacturing sector. I hope the programme continues to flourish and that we can provide many more unemployed people in the city with skills, qualifications and, ultimately, jobs. Michael King, 56, from west Hull, was unemployed for over four years before enrolling on the Pathway to Employment programme. He was offered a job as an operative with Atlas Leisure Homes at the end of his placement there. I’d spent most of my life as a semi-skilled joiner, working on contracts all over the country. It was when a project I was working on in London came to an end that I found myself unemployed and struggling to find work. It’s so pleasing to be back into work. I feel as though I have got some self respect back and I’m enjoying my new role. I’m learning new things every day and building on my existing skills. The Pathway to Employment programme has come at a crucial time for Atlas Leisure Homes, as they enter full capacity due to a flurry of orders. Michael has shown real dedication and is now in an operative role, which is what we need to cope with the manufacturing demands. The quality of his work has been of a high standard and I’m looking forward to seeing what the next cohort can bring us. The Pathway to Employment Programme is a great scheme and will keep our industry supplied with skilled individuals. Unity Training who deliver the curriculum will be working closely with those who did not manage to secure a role over the next six months to help them find suitable roles. The Pathway to Employment has been a great success so far. We have been able to engage with 40 participants who have been long-term unemployed. The first group has enjoyed the programme and it’s a fantastic opportunity to help develop people so they can get back into the manufacturing industry. The participants gain qualifications that boost their CVs and the work placements are great for getting them back into the routine of a working day. It has given them real drive to get back into employment. The £150 million preparation of a 54-hectare site on Hull’s Alexandra Dock, ready for Siemens’ offshore wind turbine blade manufacturing facility, is continuing to make positive progress. Managed by ABP and their main contractor GRAHAM Lagan Construction Group Joint Venture (JV), the site has seen the completion of a car park for the Siemens facility, along with the installation of ro-ro ramp piles, which will enable the loading of blades onto ships. The construction of a new quay wall has continued, as has work on site-wide services, such as infrastructure on the port, to provide electricity to the Siemens blade factory. The super structure for the substation has been finished by contractors Dias, and steel work is up and cladding has started on the service building, which is being carried out by Clugstons on behalf of Siemens. This will be completed in September. In terms of the Siemens blade factory, which is being constructed by VolkerFitzpatrick, the majority of internal floors, walls and services are close to completion, with cranes currently being installed. The installation of Siemens’ equipment will begin in June, with the company taking possession of the first part of the factory in August. The next phase of work will include the construction of a noise barrier and a new flood wall, as well preparing paving for the first berth at the dock, which will be open in early September. The harbour infill will be complete by July. The works at Alexandra Dock form Hull’s biggest engineering project since the port was built. It is on schedule for an early 2017 completion. With an investment of over £25m, the Green Port Growth Programme is supported by the Regional Growth Fund and is designed to capitalise on renewable opportunities. It aims to develop indigenous business growth within the renewable sector, securing long-term economic growth for the region. The programme, developed by Hull City and East Riding Councils and private sector partners, provides continual support to help local businesses recognise and embrace potential opportunities within the renewables sector. It delivers activity through six business strands: Employment and Skills Development; Site Assembly; Inward Investment; Business Support and Advice; Business Investment Grants; and Research, Development and Innovation (RDI). Dawn Hall, project manager for the Business Support strand, is seeing many local companies make the most of supply chain opportunities. To date, we have supported 230 businesses through the programme and undertaken over 100 reviews and diagnostics on companies to assess their current operations. This includes systems, accreditations, sustainability, goals, partnerships, market profile, sales plan, skills and finance to ascertain their potential opportunities within the renewables sector. So far, financial assistance has been awarded to 38 companies to support their growth into the renewables sector, and we have helped create 72 jobs. We have also appointed a dedicated supply chain co-ordinator, Fred Mead, who is helping to open doors for local businesses. This includes data collection on opportunities and improving relationships with developers and original equipment manufacturers (OEMs), for example. Since the role’s inception, we have helped companies engage with key players in the renewable energy industry, such as Siemens, Energy Works, Dong, SSE and Clugston. The Business Support strand has been instrumental in assisting local companies to expand and secure new contracts. Since enrolling on the Green Port Growth Programme 18 months ago, Pure Renewables, which specialises in renewable heating, cooling and ventilation systems, has experienced significant growth. The funding received allowed the business to achieve a vital accreditation and recruit seven new members of staff. This has enabled Pure Renewables to take on innovative new projects across the country, including the installation of a ground source heat pump at Tankersley Golf Club, Sheffield. Ground collector pipes were laid under the practice fairway to gather energy from the green. Two new eco Park & Ride facilities in York are heated by ground source heat pumps installed by Pure Renewables, and the company is also working with global yeast and bakery firm AB Mauri, making use of waste heat from its processing plant to run a heat pump. In May, the company won the East Riding of Yorkshire Council Chairman’s Business Award (in the under 50 employees category). The Green Port Growth Programme has also facilitated a relationship between East Yorkshire company Turner Timber Frames and wind energy giant Siemens. The programme assists Siemens by identifying supply chain companies and nominated Turner Timber Frames to construct the elevated training platforms which fit around the Siemens wind turbine blade moulds. 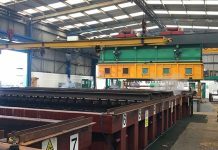 Turner Timber Frames was successful in the tender process and won the £650,000 contract due to its design, engineering and manufacturing capabilities. To find out how your company can benefit from the programme, visit the This is Green Port Hull event, which is part of Humber Business Week 2016. Held on Tuesday 7th June at the Mercure Grange Park Hotel, Willerby, from 10am to 4pm, the event will provide information on funding and support to grow your business.